Originally published June 12, 2018. Over the last 25 years of my life, I've had the incredible good fortune of spending summer in Lake Erie's "Vacation Land" where I try to squeeze out every last drop of daylight by staying outdoors till way past my normal bedtime (9:30 from Sept-May!). Vacation Land is where my husband and I happily pursue some of our passions: practicing yoga outdoors; hiking the wooded paths of East Harbor State Park; walking the dogs around Great Egret Marsh; and, biking along the Catawba cliffs shaded by a tree-canopy. A paddleboard is like a magic carpet, taking us to enchanted Lost Lake to rest among the giant lily pads. And how better to idle the afternoon away than by sipping a glass of wine while drifting aimlessly on a pontoon boat in West Harbor. When 6 o'clock finally rolls around, we sometimes hop on the boat and head to Kelley's Island or Put-in-Bay for dinner. But for us, nothing beats a good ole fashioned backyard barbecue right at home, where weekend guests pitch in shucking fresh sweet corn, slicing vine-ripened tomatoes or cracking into a ruby-red watermelon. Exhausted from a day filled with sun, sand and fresh air, we'll reward ourselves with a heavenly peach sundae from the local Dairy Dock or gooey S'mores fresh off the campfire ... then drift off to sleep with the windows wide open and the lake breeze floating in. 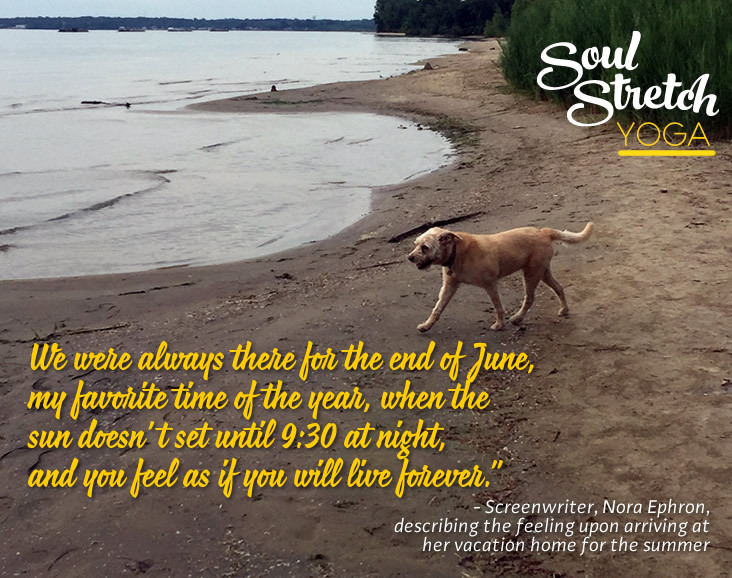 As we approach the longest day of the year (Summer Solstice is on June 21st) I hope you too will find lots of inspiration for living life to the fullest during these fantastic but fleeting glorious summer months. You don't have to be in Vacation Land to embrace the carefree spirit that summer has to offer. Because summer is not just a time of year, it's a state of mind. Shine on Lovelies!"